For some reason, I am the kind of person who does not notice doorknobs. The doorknob on my front door was extremely tarnished, and the inside knob was scratched all over (I have no idea how that happened). It never bothered me, and I never really thought about it. However, when the child of a neighbor commented on the poor condition of the twenty year old knob, I knew it was time to replace it. Since I do not notice knobs, I am really not sure what style people are doing these days. So, I decided to pick some knobs based purely on what I like (and based on what Lowes had in stock). The outside part that I picked is fairly standard: a simple design with venetian bronze finish (it provides a good contrast to my light colored house). The inside knob looks like the picture above. I originally wanted to get an egg shaped knob, but I was shopping at Lowes and they only had standard combinations available. This style was available with the outside handle and bolt that I liked. Now that I have replaced my front door knob I am suddenly noticing that all of my knobs downstairs are dated and scratched. Isn't that the way it always happens? You replace one thing, then you suddenly notice that something else no longer looks quite right. I went to Lowes today to see what kind of matching handles they had in stock, and realized that they did not have the quantities available that I needed. So, I went to the internet, and was pleasantly surprised to see the variety available in the brand that I had picked (and at much cheaper prices). Any opinion of egg knobs vs. levers? It seems obvious that it is important to have the same finish on your knobs on the same level of a house. Is it just as important to have the same design? Would it look strange for me to have a lever on the front door, and egg shaped knobs on the rest of the doors? If I go with egg knobs, I could always switch out the inside knob on the front door to egg if consistency is that important. Thank you in advance for your insight and opinions! I notice doorknobs too! I like levers over the egg knob. Though levers scare me if they are on the inside - because we had a neighborhood dog open his own front door to come storming out barking at us on one of our night walks because their door had a lever on the inside and the dog hit and swung the door open as he was barking and lunging at the door at us. But - the egg knob, is visually confusing I think. Not sure why - but something from an experience design class I took a few years ago makes me think that while the egg knob is different and maybe a little aesthetically pleasing - it isn't entirely functional - I can never turn them right or grip it correctly or something - I think our dentist office has that kind of knob and it always bothers me when I try to leave. I like the egg knobs. My parents have some in their home. However, I know that many people find the levers are more user-friendly, especially for the elderly or people with arthritis. I think all your selections are quite lovely! We have levers throughout my home...I just wish they had more weight. I like a knob/lever with some heft in the hand. Just a personal preference. 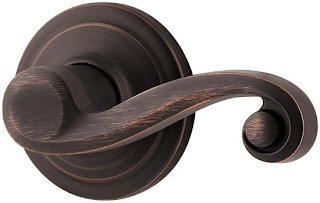 I looked through my computer picture files to see what kind of doorknobs people have. The real estate listings have the clearest shots of the doorknobs, and it seems to be fairly equal - levers and egg shaped or round. One thing I noticed is that if there is a lever on a French door, both doors have the lever. My French doors currently have just one knob, as one side opens for passing through (and locks); if you want to open the other side, you open the bolt and pull the door open. Visually it would probably be best to put a dummy knob or lever on the other side for visual balance, especially with a lever. Egg knobs are difficult to use for frequently used doors. Especially an entry door which may have a small child, handicapped, arthritic, slippery/wet hands, full hands exiting thru that door. Additionally, a lever or larger knob is considered safer in the event of a quick exit for an emergency such as a fire. This was written for me!!! When we built our house 14 year ago, brass was in and for the past 10 years I've hated it! One by one all of our knobs and faucets starting falling apart and looking like junk. Finally last year our front doorknob broke and Ben said replace it - and I said I want pewter (or a fake pewter) and he said go for it and I said - all over and he yes and so I did a jig. "All over" gets expensive. So I picked out an Emtek - hand polished finish. replaced everything. one month later I started to notice the finish was coming off. Since then I have noticed this in everyone's house - even the dark, dark black and brown finishes rub off. We called the company and they replaced it all, ALL for free! I picked out Emtek's steel hardware this time instead of a hand applied finish - it's called satin steel and these is no finish on it, so it will never tranish or rub off. The choices in the steel line were much smaller but I love my levers - they are the basket cage kind. ALSO - be SURE to look for a pretty, large, backplate! That makes the door knobs so much more attractive and custom looking. Most hardware companies have backplates. I love the eggs - I think they are so classic. Let me know what you do. I bet you are using Emtek! right? I love hardware - I know, dork!! I tend to like lever as opposed to egg knobs but those in your photo are very handsome. I like them streamlined, not overly modern but without swirls. As for finish, I am going through a rubbed bronze phase, so the ones you showed are perfect. It's ultimately about what you like, feel is best to open a door and also what your decor is. When I saw your knob I thought of Emtek too. That's what I used throughout my own home. I chose the levers and am quite pleased with them. Easy to use, classic and elegant at the same time. Thank you for the comments, and I am happy to see so many new posters to my blog! Keep the comments coming. I love reading them. I like egg knobs. The levers while functional can be too functional, meaning little children and dogs can indeed open them very easily. Levers are very ordinary, I know we are talking knobs here but egg shape is much more beautiful (in my opinion). Love the Venetian bronze finish - not ordinary! I also used Emtek when we replaced our door in the kitchen - the all steel, like Joni - and have been very pleased. I prefer a knob to a lever, but I don't think there is a right choice. I prefer the egg knob. In fact, it looks exactly like the picture you've posted. We moved into our house a year ago and I chose egg knobs everywhere except for the front entry. The exterior knob is the kind you have to press your thumb to unlatch the door (sorry can't remember the correct term). Our old house had the levers. They were useful, etc., but I just didn't like they way it looked. I love my egg knobs. We are in a constant state of renovation and had a hard time deciding too. In the end we picked the lever one b/c somehow the egg was hard to open. The lever is nice especially if you are juggling a bunch of things (or kids) and just have a free elbow. I love door hardware. We have a very old house, and very old hardware. Antique brass that looks almost like oil rubbed bronze. When we replace hardware, we use oil rubbed bronze to replicate the look of old brass. I do not have time to polish our hardware and I don't mind it looking dark from age. We did put an egg knob on one of our doors. It is more difficult to open, but it looks cool! :-) I like the levers though and they probably are easier to use for older people and kids especially. The egg knob feels strange to the touch, but guess I would adjust to it fter some time. I have known doggies that can actually open the lever door and let themselves out!...a good thing or a bad thing? The original knobs here in the 100 year old pile were eggs. They are upstairs in a box waiting for me to replace the bottom of the line ones that the contractor installed during his portion of the renovation. The eggs are far more elegant. I like egg knobs. I replaced all of the knobs in my house. I ordered them from Apex in Atlanta and I cannot tell you how many times they messed up the order. I also had to replace all of my hinges. That was a big project, the doors all had to removed and rerouted to accomodate the new hinges. Good luck with your project. I love the finish you have chosen. Lever knobs are considered accessible, because a handicapped person can press down and get the door open, so that might be something to think about. I think it's good to be consistent with the style throughout the house, but, IMHO, the front door can be different from everything else. I like the way the egg knobs look, but I know a lot of people have trouble with them. Is there a round knob in the same finish? I can't seem to get away from loving the egg-shaped knobs. Very streamlined as you put it. Personally I'm not fond of egg-shaped knobs. My parents had some and they drove me mad as they never seemed to fit my hand properly or comfortably. I advise against them unless you test a few! The round knob seems to fit the natural grip of the hand, or better yet, the lever seems the best. Plus, your dog can open the door if your house is on fire (a dog did this, I read!). hehe. Seriously, levers seem to make the most sense ergonimically, although I don't care for the way they look. Personal taste really. For all that one touches them, it isn't like you will get carpal tunnel from a bad choice. But I really did deplore the EGG knob!